The current map of the area of the Archipelagoes you will be gaming in. The campaign will start in the township of Vratislav, in the northwestern corner of the Protectorate of Jova. Vratislav is a town of approximately 2300 people, and is the main hub by which the products of Spilliholt and Scors Borough are distributed to traders taking them to Solom, Aerye, and other areas reached by sea. 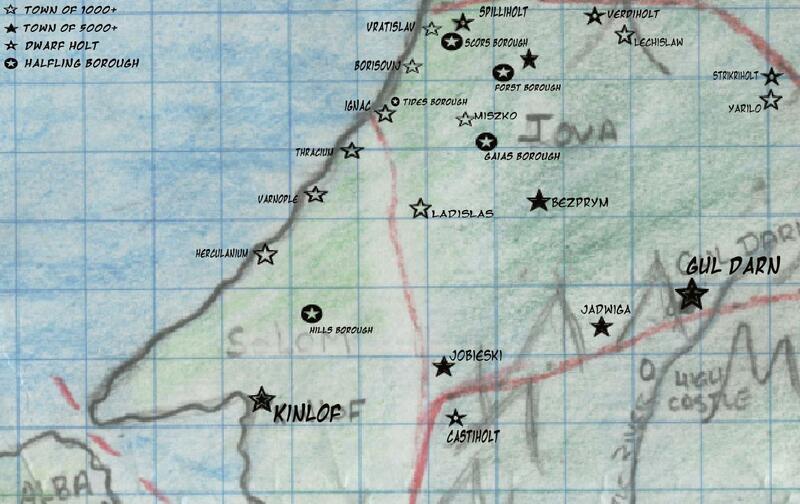 Vratislav has one of 3 harbors on the Jovan coastline, and is only as small as it is because it was burned to the ground during the conflict with Aerye that created the Protectorate of Jova, and it has taken some time for the people to start coming back. The Protectorate is made up of a loose confederation of duchies left over from the days before theunification led by Riddlemark forces under the Priest-King. Each tends to be self-sufficient, with small farming communities surrounding a larger town or city that serves as a marketplace for foodstuffs and luxuries, as well as a local seat of government. In prior times, most laws were enforced by local dukes and their guard with assistance from temples, but that has been replaced by all laws becoming religious matters, and therefore within the priests' purview. This seeming shift is less obvious because of the fact of many of the local dukes taking on vestments of Jove, allowing them to merge their secular powers with those of their new office. The shift in power is not complete, and is lessened the further from the capitol one travels. There are rumors of an Inquisition that is rooting out other faiths and those who support them, but it is discounted as rumor by most in the hinterlands. Who would believe that the priests of Jove would burn priests of Gaia as witches? Dwarves are most comfortable inside the womb of the Earth Mother, and their homes reflect this. Each Holt is built into and under mountains that contain large amounts of raw materials for their smelters, and so they expand their living quarters as they mine out the materials that form the lifeblood of their culture. The most important part of Dwarven culture is their craft, no matter what that may be. To a Dwarf, there is no more sacred duty than to excel at something, whatever that may be. There is no more bias towards warlike matters than there is in peacable, so a smith can be toasted for his ability to make roses from steel as much as for his skill in making rifles. This sacred belief in making a craft your life, has led to the rise of a nation of artisans above and beyond any others in the Archipelagoes — even the Elves have only singular examples that may be better at building something. Beyond this, family is the strongest bond. A Holt will generally be related to each other somehow, and no-one ever leaves the Holt forever. Only the most heinous of criminals is ever exiled — most dwarves will suicide before they actually serve the sentence. The Halfling boroughs are a complex network of farms in an area that are all related in some fashion. Halflings will live in and under their crops as often as not, living in complex burrow homes that can often extend for hundreds of feet, and usually roofed over with sod, thus providing more space to grow crops on. They are the penultimate farmers, growing more crops successfully than any others in the Archipelagoes, and excel in the mixture of open meadows and light forests that dominate Jova. The grand majority od halfling clerics belong to Gaia, and they are a peacable sort. The leaders of families and boroughs tend to be Gaian Priestesses, and this had led to some conflicts. Rumors have it that the halfling has been declared an ab-human, meaning they are no-more than animals, and should be treated as such, but few of those who have shared a pipe of tabac would agree with that notion.